Because of better education about the benefit of good oral health when it comes to their overall physical wellbeing, regular visits to dental clinics have become a way of life for North Americans over the past several decades. Patient demand and growing customer expectations from sectors outside of healthcare has led to a change in the way dentists do business. As a result, they are expanding their once modest clinics into large, modern, consumer-friendly facilities, and using the most advanced technological equipment available. Competition among practices is strong, and the pressure is on to present an appealing storefront while adopting cutting edge technology in order to attract clients. To complement the superior level of care dentists now strive to provide for their patients, many are turning to cloud-based technologies that streamline and modernize office procedures, unify multi-locations and reduce cost and complexity of delivering better customer service. Since the 80s, the focus of dental care has changed to hygiene and oral health screening – in other words, preventive medicine – resulting in a markedly decreased need for extractions, fillings and dentures. This, however, has not led to fewer visits to the dentist, but rather increased demand for enhanced procedures. Canadians are well aware of the health and social impacts of neglecting their teeth and gums, and are willing to invest time and money to ensure the best treatment plans possible, including cosmetic dentistry, implants, orthodontics, and geriatric dentistry. Practitioners have responded by diversifying and expanding, which allows them to offer a comprehensive range of services to their patients. As a result, dental clinics – with a full complement of hygienists, general practitioners, periodontists, oral and maxillofacial radiologists, etc. – are busier than ever before. With the cost of opening a new practice costing well in excess of half-a-million dollars, savvy practitioners are pooling their resources to equip and staff large clinics instead, enabling them to provide the greatest range of procedures and services to the greatest number of people. Instead of having to refer patients to outside resources, specialists are located within the practice, providing a convenient service to customers as well as keeping business in-house, even if at a different physical location. Patients are comfortable knowing that their care is under the supervision of one practitioner, and that they can rely on established standards of practice across all clinics. Of necessity, there has been a significant shift in the way clinics handle business. Today’s modern multi-location clinics require an integrated system that enables them to operate as a single entity with multiple branches in order to run effectively. This is a trend that has grown beyond dentistry and is now seen across all medical professionals who are replacing single location solutions or paper-based operations with comprehensive digital platforms. It enables more streamlined workflow processes, shared information, and at-a-glance analytics which help keep their respective businesses strong and successful. In the past, accomplishing a successful integration was not an easy task. Essentially, a software solution and a very powerful hardware infrastructure requiring significant IT manpower and budget had to be custom built. Now, utilizing the most powerful cloud service platform in the world – Microsoft Azure – ADSTRA is able to deliver a total integrated solution designed specifically for dental clinics. Microsoft Azure is being used by thousands of companies around the world, including Fortune 500 companies as well as medical records companies, which are putting actionable data in the hands of clinicians and healthcare providers. Dental clinics across North America have relied on ADSTRA since 1994 for managing their day-to-day operations. For more than a decade, one large branch of government, with over 100,000 employees, has been using ADSTRA to manage more than 30 dental clinics around the world, making it simple and easy to treat any employee from any location. All patient records, x-rays and other pertinent information are available to every clinic, saving time, reducing costs and, more importantly, enhancing the level of patient care for this agency. 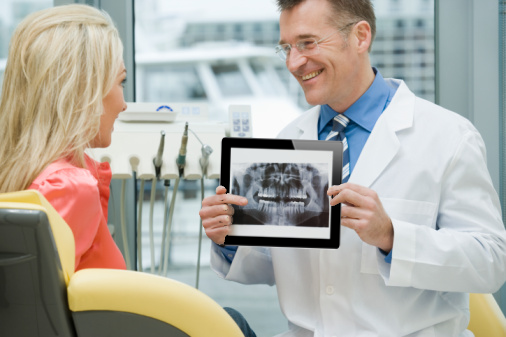 ADSTRA has a proven solution that provides dental professionals with efficient, paperless patient management, appointment scheduling, charting, imaging, financials and communications. Access data from multiple locations using computers, tablets, or mobile devices. An all-inclusive maintenance service is another strength of ADSTRA’s Cloud offering. The software is pre-installed and configured, interactive software training and support is provided on-demand, and all software updates are automatically applied. Trends in dental care are changing. It’s time to start the conversation about how the infinite power of the Microsoft Azure cloud combined with ADSTRA’s proven expertise in information management systems for oral healthcare can help your dental clinics face the future.